It is that time of year, it’s finally summer again! That can mean one of three things. You live somewhere that has amazing weather and you will spend every waking moment outside enjoying it. You live in a place with mostly nice weather, but sometimes it gets unbearably humid out so you want to enjoy the good days when you can. Or it means you live in Arizona, like we do, and it will probably be too hot to go outside unless it’s to the pool. However, no matter where any of us live we always end up outside in the summer. Today we are sharing some tips to get your outdoor space summer ready so you won’t have too much prep work needed when a nice day happens and you just want to spend it outdoors (and not getting it ready to enjoy). So read on to get your space spruced up so it is summer ready at a moment’s notice! First and foremost keep your yard maintained! This is the worst chore to have to do (especially if the heat is beating down on you), but if your yard does not look inviting, you will not want to spend any time in it. Keep up with the yard work. This will help in three ways. First it will make the yard more welcoming and inviting to you so you will actually want to use it. Second, it will make sure the yard is not distracting from all the other things you add to your space to help you enjoy it. And third, it will make it ready for anything. Surprise guest, no problem, the yard already looks great, let’s all head outside for a drink! Spruce up your patio furniture. Create a few areas if you have the space. 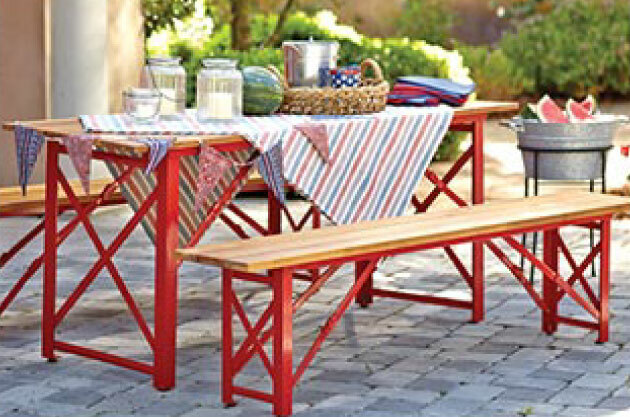 Create a dining area with a great picnic style table. We love the European beer garden style tables (Cost Plus World Market has one that is currently on my wish list). Also create a separate lounge seating area with comfortable chairs to lounge in and relax or to hang out with friends all night. Use fabric to add privacy and shade to outdoor spaces. Some of you already have a covered patio which is great for shade. If you do not consider adding one or build a pergola you can grow some vines on to create shade. Still not in the budget? You can do a lot with fabric to create shade and privacy. Hang it like curtains that you can draw closed or overhead to create shaded area. This can be done with any fabric you can find at your local discount fabric outlet. 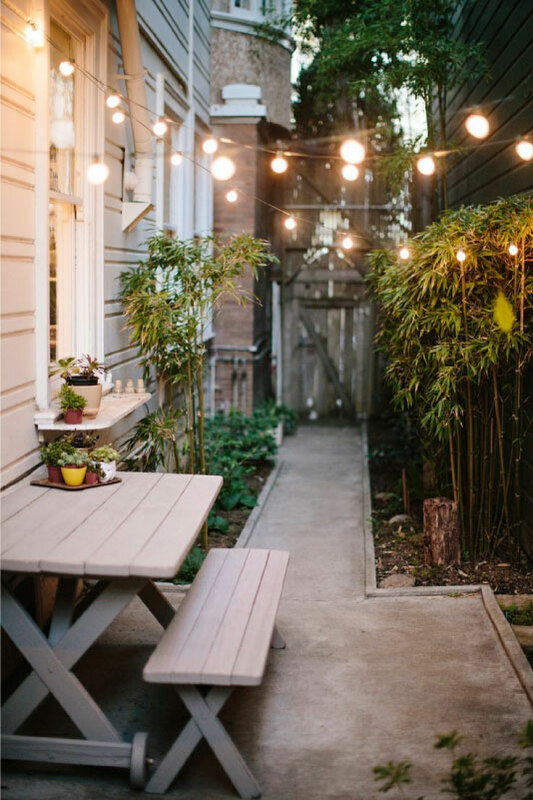 Use string lights to add a soft glow over your entire outdoor space. Lighting is Key. Most of us have that one back patio light, but that just isn’t great for larger groups or to really see anything. What you want to do is add layers of lighting to the space so you can shut that patio light off and create a nice ambiance with the lighting you have added. 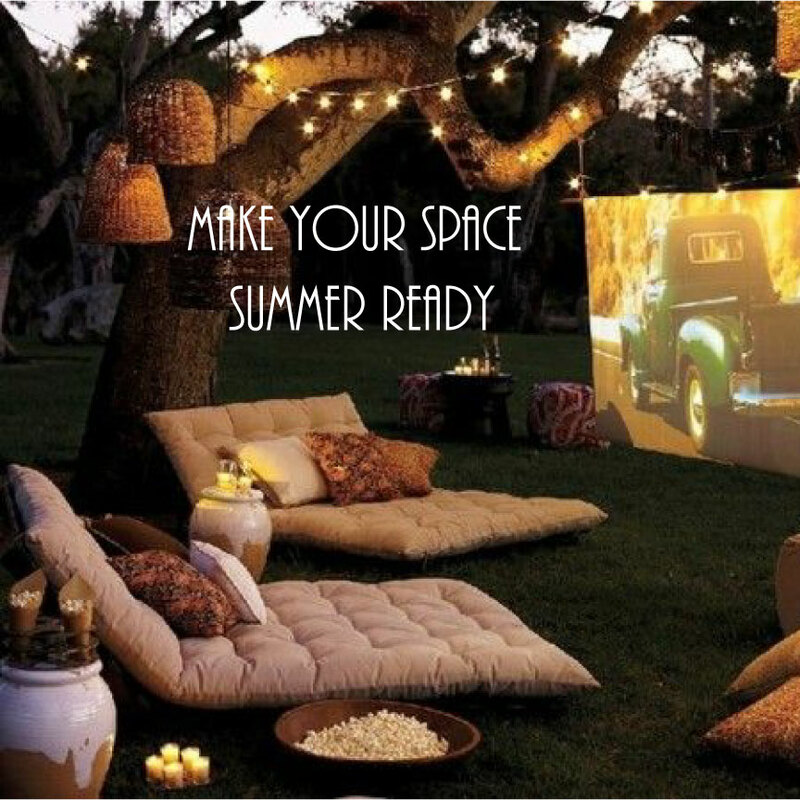 Great ways to do this are with string lights. They can be used to line the patio or crisscrossed all over the yard for an overall glow on the entire space. 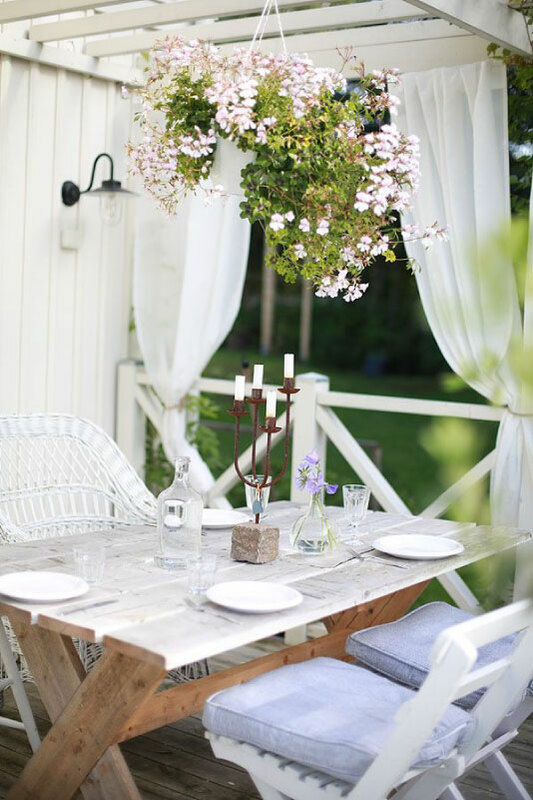 Use hanging lanterns to add light to seating areas or over a dining table. Lastly, use LED battery operated candles grouped together for gorgeous (and flattering) candlelight in your lounge area. Now it’s time to add some life to your space with color. This can be done with the fabrics we mentioned above or in your accessories. Choose brightly colored floor lanterns, bold patterned pillows for dining and lounge area, and plants. Add potted plants around your space with brightly colored flowers or succulents. Short on space? Use vertical planters. Not only will it add color, but it will act as a bit of outdoor wall art. Be prepared for parties, last minute guests, and impromptu entertaining. No one likes to spend all their time prepping or running around while guests are having fun. Get an outdoor bar cart that can be easily stocked with everything for drinks you are serving, ice, and extra glasses. Keep everything organized together inside in a storage container so you can just grab it when needed and set up your bar cart in a matter of minutes. Keep a stock of wooden silverware, paper plates, and napkins with this as well. Easy set up and no clean up required when done. Lastly, be prepared to entertain with more than just conversation. Have outdoor games at the ready like corn hole, darts, or a large yard Jenga set. Have a small basket at the ready filled with squirt guns, water balloons and games for the kids as well. And always have some extra beach towels on hand for clean up when the water is involved. Just roll the towels and store in a basket so guests can grab them when needed. If you live in a cooler climate fill the basket with extra blankets for when nights get chilly. Now you should be ready to enjoy your outdoor space and not be ashamed to invite last minute guests out back to enjoy summer!